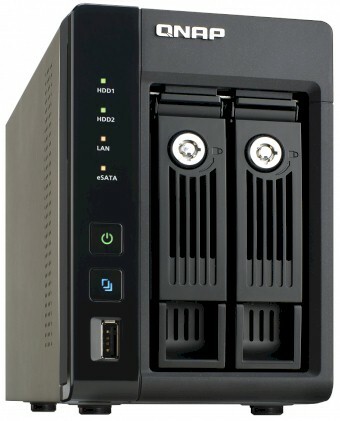 Summary BYOD two-bay Intel D2700 Atom RAID SATA NAS with many serving options. The last two-bay QNAP NAS we reviewed was the TS-212, based on Marvell's 1.2 GHz Kirkwood CPU. Today we're going to be taking a look at the TS-269 Pro which is based on an Intel dual-core 2.13 GHz Atom processor. The new CPU greatly boosts performance over the TS-212 we last tested. The TS-269 Pro joins the ranks of the Synology 1512+ and Thecus N4800 in D2700 Atom NAS offerings we've tested. The rear panel holds a nice selection of ports and connectors and good things seem to come in pairs. Two USB 3.0 ports, two USB 2.0 ports and two Gigabit LAN ports. You get only a single eSATA connection, however. You may also notice the HDMI port up top that isn't labeled. According to QNAP specs, that is a VGA interface reserved for maintenance. Under the hood of the TS-269 Pro you will find a 2.13 GHz Intel Atom Dual-Core D2700 CPU, 1GB of DDR3 RAM that is expandable to 3 GB via one open SoDIMM slot on the bottom side of the board. There is also 512 MB of flash, two Intel WG82574L Gigabit Ethernet Controllers and an Etron Tech EJ188G USB 3.0 Host Controller. The last item is a departure from the NEC USB 3.0 controller usually found. A photo of the TS-269 Pro's board is shown below. Power consumption measured 52 W with the two QNAP-supplied Seagate ST1000DM005 1TB drives spun up and 33 W with them down. The high standby numbers were due in large part to the beefy processor. Fan and drive noise could be classified as Medium-Low, with most of the noise coming from the drives. Firmware at test time was 3.7.3 Build 20120801. This version includes the MyCloudNAS feature and ElephantDrive cloud backup option. We covered MyCloudNAS in the TS-112 review. For a run-through of V3's other features, see the review or the online demo.